Thousands of people rallied in Moldova’s capital, Chisinau, on Sunday in the latest act of a long-running anti-government protest demanding snap elections and the government’s resignation. Some protesters fought with police, leaving 14 officers injured. 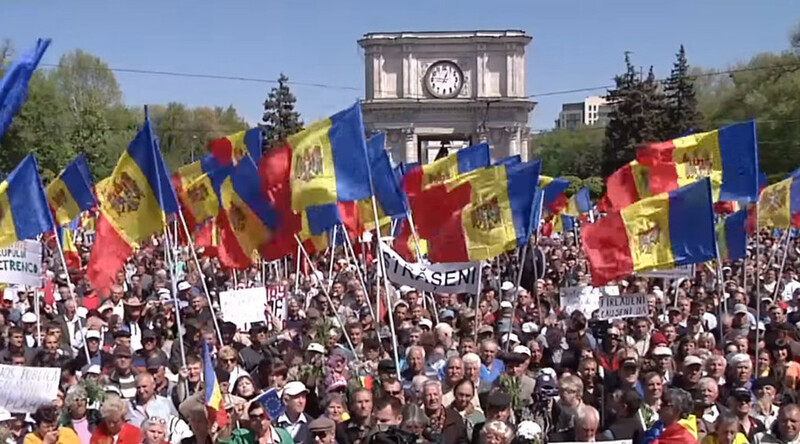 The rally was staged by the right-wing Dignity and Truth Platform Party, the Liberal Reformist Party, and the Liberal Democratic Party of Moldova. Protesters began gathering near the parliament building on Sunday afternoon chanting “Snap elections!” and “Down with the government and the parliament,” according to Sputnik. Members of Dignity and Truth accuse the government of being highly corrupt, dependent on local oligarchs, and responsible for the impoverishment of the population. The party, which is comprised of former politicians and advocates promoting reunification with Romania, also blames the Moldovan leadership for being slow in its efforts to integrate with the EU. January’s appointment of new Prime Minister Pavel Filip, who allegedly has close ties to Vladimir Plahotniuc, one of Moldova’s richest businessmen, has angered the opposition and the public. Police carrying batons and protective shields, joined by riot control units and mounted police, cordoned off streets leading to the government building and parliament as the rally began. The protesters surrounded the government building soon after, while chanting against the country’s political elite. “It’s a symbolic encirclement of the governmental compound. By doing so, the demonstrators show their dissatisfaction with the illegitimate government,” Vasile Nastase, one of the opposition leaders, was quoted as saying by RIA Novosti. Later in the day, a large crowd gathered outside Plahotniuc’s house shouting “Down with the mafia” and “Power to the people, not to the oligarchs.” A similar standoff took place nearby, with crowds throwing stones, sticks, eggs, and bottles at police who were protecting a GBS business center owned by Plahotniuc. Some sporadic clashes were also reported after a small group of protesters attempted to break through the police cordon to enter the parliament building. Fourteen police officers were injured in clashes with the protesters, Alexander Pinzar, head of Moldova’s General Police Inspectorate, told journalists later on Sunday. “Most officers were hit by stones, they’re in stable condition at the moment,” he was quoted as saying by RIA Novosti. “One suspect has been detained for 72 hours.” The police have opened a criminal investigation into the rally, Pinzar added. One of the protest’s leaders, Inga Grigoriu, called on demonstrators to rally again on Monday morning in order to disrupt the government’s work, according to Reuters. Chisinau has seen numerous rallies since last September, with massive protests erupting sporadically. A coalition of opposition forces has been demanding the resignation of Moldova’s president, prime minister, and chief prosecutor. It also calls for an investigation into the “theft of the century,” namely the disappearance of $1.5 billion held by three national banks ahead of the 2014 parliamentary election.